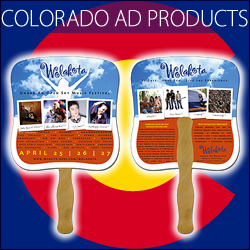 Serving Colorado with Promotional Ad Product Marketing Sales since 1995. Colorado Promotion is the choice of hundreds of Colorado Businesses, Organizations, Schools, Non-Profits, Events, and more around the state of Colorado when it comes to marketing via creative advertising products. With over two decades of experience handling promotional item orders large and small, Colorado Promotion has relationships industry-wide with vendors, factories, printers, and more, and we go the extra mile for you and your business when it comes to locating the BEST products for your particular ad marketing needs.